It seems we have confirmation Samsung will be launching a 4.99-inch touchscreen very soon, and it will sport one of the coming year’s most desirable features, a 1080p resolution. The screen was part of a Samsung display at CES, which showed the company’s ever-expanding range of screens of all different sizes, and was pictured by Anandtech. 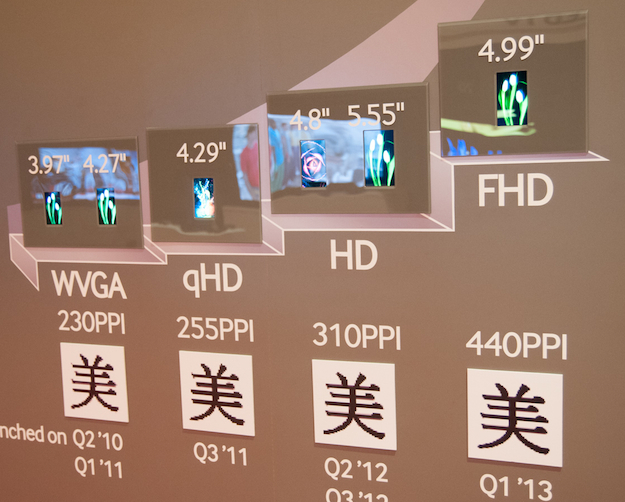 In addition to the size and resolution, a pixel density of 440ppi was listed, as was a launch date of Q1 2013, a period that ends in March. This isn’t the first time we’ve heard about such a screen from Samsung, as back in November last year, a report in a Korean newspaper claimed the firm would be bringing a 4.99-inch 1080p screen to CES. That report could clarify the Q1 2013 launch date too, as it provided the same timeframe for the display to enter production, so we shouldn’t expect it to find its way onto a phone for a few more months yet. So on which device can we expect to find this screen? Rumors surrounding the Galaxy S4 have linked the next Samsung super phone with a 4.99-inch, 1080p screen already. This would make it larger than the panel used on the Galaxy S3 but crucially, still smaller than the Galaxy Note 2 and the perceived 5-inch starting point for tablet/smartphone hybrids. An image supposedly showing the Galaxy S4 leaked last week and the device pictured had a noticeably thinner bezel around the display, suggesting the screen size had been increased without making the chassis larger. Samsung managed a similar feat with the Galaxy Note to Note 2, when its screen also grew by 0.2-inches last year. If production of the 4.99-inch screen does begin before March, then the device on which it will make its debut will surely come a few months afterwards, say around May? Coincidentally, this would also be the month we’re expecting the official launch event for the Galaxy S4 to take place.